A remote controller is useless when the user has not the remotest idea where it is...this simple device keeps it in the area where needed, yet allows a range of motion for multiple users and user positions. The materials used are quite inexpensive. Pvc pipe is cheap, light, yet strong enough for this purpose. Similar rigid tubing or wooden dowel may be used. Nylon cord suspends the device and remote. Elastic cord adds flexibility. Attachment to the remote will depend on its construction. A slice of bicycle innertube or wire might be used. If necessary, drill or melt small holes in the plastic in a non-critical area. The counter-weight may be a piece of iron or steel, or a rock in a sock. Adjust the center tie point to balance. To better control the remote's to return to position after release, use two parallel suspension cords in the center. Suspend from the ceiling so the arc of movement is most convenient, yet least likely to bonk users. There are few common devices that cannot be improved or better adapted to a particular use. 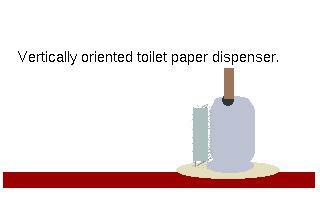 We are accustomed, for example, to horizontal toilet paper dispensers. Those work, but require both ends of the axle to be secured, which complicates the design unnecessarily. As you might suspect, I do some of my best thinking on the toilet. My solution is to use a vertical axle. Although my axle is the shaft of a clamp secured to the shelf in front of the toilet, the design is highly variable. The important part is the friction-reducing component, allowing the roll to turn freely enough to avoid premature tissue separation. The lid from a plastic margerine tub works perfectly for this. I suggest removing any residual oleo first, though the design may well allow for a margerine of error. With a sufficiently long axle, two rolls may be placed on it, so there is always a spare. Place an additional margerine lid between rolls so the top one can rotate independantly.